The Burner Booster – Product Video Production | Rewatchable, Inc. If you live near Boston, Massachusetts, it is that time of year that you start thinking about winter and the cost of heating your home and/or business. At Rewatchable, we love learning about our clients and their products. One of the most interesting product videos we have produced is for a Boston area company called Energy Efficiency Solutions. 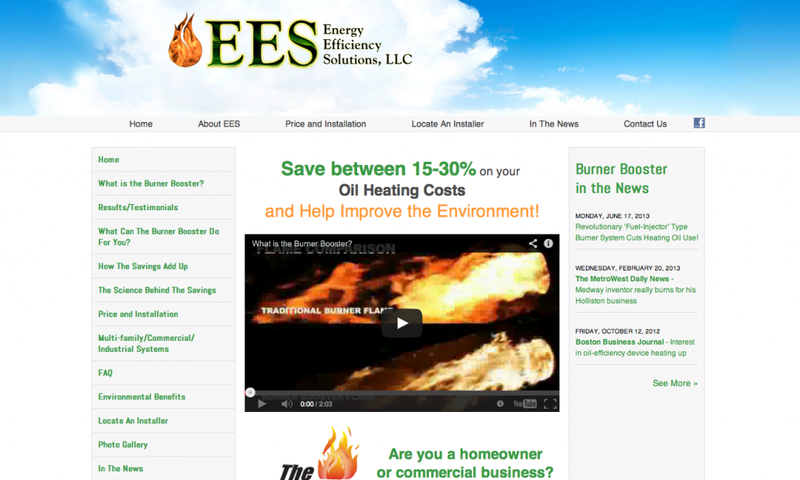 EES is the creator of a product called The Burner Booster that helps reduce oil bills for homeowners and businesses. The Burner Booster “is a unique, patented, higher-efficiency replacement oil pump and nozzle system that works with a specially designed oil burner to create ultra-efficient combustion that reduces oil use and greenhouse gases and other harmful emissions.” Get all that? Some of us with weak science backgrounds might struggle with a text-based explanation and that’s why a product video was a great option to help explain The Burner Booster’s value proposition. You can see they are using the product video we produced right on their main page. (below) The product video quickly explains the technology and helps consumers understand potential energy savings. Also, they also have posted the product video on YouTube so that it is more likely to show up in search results. If you are paying a fortune to heat your home or business, you might want to take a look at The Burner Booster.